1. What is your approach to managing a patient with acute-onset (< 48 hours) atrial fibrillation (afib)? Which patients do you cardiovert? Does your management algorithm differ for patients with acute-onset rapid afib? The management of acute-onset afib in stable patients remains controversial. (Clearly, in those that are unstable, immediate electrocardioversion is indicated). Historically, many of these patients have been managed with rate control and anticoagulation as necessary. This approach seemed supported by the RACE and AFFIRM trials, which found rate control to be non-inferior and/or preferable to rhythm control. However, these studies were performed in outpatients with chronic atrial fibrillation. These patients were, on average, older and with established cardiac disease, thus there is much debate about whether the results can be extrapolated to apply to those with acute-onset afib, especially in the ED. A growing body of research on acute-onset afib is beginning to suggest that ED cardioversion may be safe and effective, and that it could decrease admission rates and ED length of stay. It may also reduce the need for outpatient medication such as anticoagulation and rate-controlling meds. A few studies evaluating one- and six-month outcomes have not shown an increase in thromboembolic events in those who were cardioverted in the ED. The longer a patient remains in afib, the less likely it will be that a later cardioversion attempt will be successful. Therefore, ED cardioversion may give the patient a better chance of returning to a sinus rhythm (Fuster, 2011). The approach of cardioverting acute-onset afib, has been protocolized by a research group in Canada as the Ottawa Aggressive Protocol, and is increasingly being used there. The key element in determining which patients to cardiovert is duration of the arrhythmia. Time since onset must be clear and less than 48 hours. Additional factors may include severity of symptoms (with more severe symptoms pushing the balance towards cardioversion), and patient history (i.e. if a patient has a history of paroxysmal afib and has been successfully cardioverted in the past). Whether the presenting rhythm is rate-controlled or not should not influence the decision of whether to cardiovert. The only proviso is that patients with RVR are more likely to be hemodynamically unstable and/or symptomatic, which may make the cardioversion (or at least rate control) more urgent. As rate control can be more quickly accomplished than setting up for electrocardioversion, it is reasonable to administer rate-controlling medications in a symptomatic patient, and then proceed with cardioversion. The management of acute-onset afib, of course, warrants an investigation into potential causes of the arrhythmia. 2. If you decide to cardiovert a patient, do you prefer to use chemical or electrical cardioversion? Do you take a sequenced approach? Which agents do you prefer for chemical cardioversion? Again, there is no agreed upon approach to cardioversion. Some advocate going directly to electrocardioversion, as it has a higher success rate (80-95%) over chemical cardioversion alone (50-70%), is faster, and lacks the pro-arrhythmic potential and possible side effects of anti-arrhythmic agents (Decker, 2011). Others recommend taking a sequenced approach of an attempted chemical cardioversion followed by electrocardioversion if the former fails. There are some data to suggest that giving an anti-arrhythmic agent before attempting electrocardioversion may increase the success of the electrocardioversion; however, most of these studies were performed with patients in chronic afib. At this time, the ACC/AHA considers pretreatment with anti-arrhythmics before cardioversion in acute-onset afib to be optional (Fuster, 2011). If cardioversion is the goal, it is our opinion that electrocardioversion should be attempted first as it is faster and more effective. If this fails, the patient can be rate-controlled and then admitted for either attempted chemical cardioversion or establishment of long-term rate-control/anti-coagulation management. Several agents have been used to attempt chemical cardioversion. These include flecainide, propafenone, ibutilide, dofetilide, amiodarone, procainamide, and others, with the first four listed as Class I recommendations by the ACC/AHA (Fuster, 2011). The decision of which to use will depend in large part on patient symptoms, presence of underlying heart disease, presence of QT interval abnormalities, and whether the drug will require telemetry due to pro-arrhythmic potential. 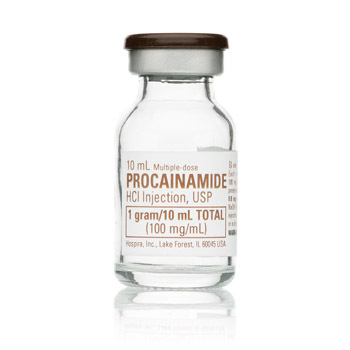 While procainamide is not regularly used by cardiologists, the group advocating the Ottawa Agressive Protocol have argued it is effective and safe to use in the ED with subsequent discharge of patients. Although it has not been tested sufficiently in chronic atrial fibrillation to make it a recommended drug by the ACC/AHA, it has been used amply in acute-onset afib, with several studies suggesting its superiority to placebo (Fuster, 2011). It is interesting to note that amiodarone is considered a Class IIa recommendation by the ACC/AHA. Even though its success rate in cardioverting atrial fibrillation patients over 24 hours is quite good, it has a low cardioversion rate within 8 hours of administration, making it a less useful medication in the ED (Chevalier, 2003). Looking to the future, a new antiarrhythmic drug, vernakalant has shown great promise in achieving sinus rhythm in acute-onset atrial fibrillation. It has been approved in Europe but is still pending FDA approval. 3. Which patients do you choose to anticoagulate? What approach do you take to anticoagulation? The question of anticoagulation applies to both BEFORE and AFTER conversion. For patients who have been in afib for less than 48 hours, anticoagulation need not be started before cardioversion. If, however, the patient has been in afib for either an unknown amount of time or more than 48 hrs, he or she will either need a TEE to evaluate for the presence of an atrial thrombus or be anticoagulated for 3 weeks before cardioversion. After successful cardioversion, the patient would typically be placed on 4 weeks of anticoagulation. Regarding anticoagulation after conversion of an acute-onset afib, approaches vary. It is worth noting that risk of stroke is 5-15 times higher without anticoagulation in afib (both chronic and paroxysmal). Thus, if the patient has had prior episodes of acute-onset afib (i.e., PAF), then the patient should probably be anticoagulated based on his/her CHADS-2 score. If, however, this is the first known episode of atrial fibrillation and sinus rhythm is achieved, it is not necessary to start the patient on anticoagulation. In the Ottawa Aggressive Protocol, none of the patients were started on anticoagulation after successful conversion, regardless of whether the afib was paroxysmal or new. 4: Which patients with acute-onset afib do you admit and which do you discharge? If the patient is successfully cardioverted, do you admit or discharge? If you discharge them, do you prescribe them any anti-arrhythmic agents? If a patient with new onset afib is successfully electrocardioverted, shows no signs of cardiac ischemia, and is asymptomatic, he or she can safely be discharged after a short period of cardiac monitoring to ensure continued sinus rhythm. If a patient has been chemically cardioverted, a longer ED stay, or possibly a telemetry admission, may be warranted, depending on the pro-arrhythmic potential of the agent used. As noted above, in at least one Canadian study, procainamide was used with subsequent ED discharge of patients successfully cardioverted. If the patient fails the above criteria he or she should be admitted. If cardioversion is attempted and failed, the patient should be rate-controlled and admitted. If no cardioversion is attempted, the patient should be rate-controlled, but whether to admit them depends on the patient’s age, symptoms, comorbidities, access to quick cardiology follow-up, success of rate control in the ED, and comfort of the practitioner with starting outpatient anticoagulation as needed. Ultimately, many of these patients are admitted. For patients successfully cardioverted in the ED who are set to be discharged, it is not necessary to start them on an anti-arrhythmic. Data suggest that while anti-arrhythmics do reduce (but far from eliminate) recurrence of atrial fibrillation, they have multiple adverse effects associated with them, including being pro-arrhythmic and in the case of some, increasing mortality rates (Lafuente-Lafuente, 2007). Amiodarone has been shown to be among the more effective agents, but of course has serious side effects and is therefore not recommended for long-term use. Bottom line: let your patient’s cardiologist sort this out as an outpatient. Do not start them in the ED (indeed, doing so would likely necessitate an admission to monitor for arrhythmias). Of course, any patient presenting with recent-onset afib who is discharged should have close cardiology follow-up, even if successfully converted, as recurrence rates of afib are high (71-84% at one year), and because they will need a more thorough cardiac evaluation including a TTE, etc. Chevalier P, et al. Amiodarone versus placebo and class Ic drugs for cardioversion of recent-onset atrial ﬁbrillation: a meta-analysis. J Am Coll Cardiol. 2003; 41: 255– 62. Decker WW, et al. A prospective, randomized trial of an emergency department observation unit for acute onset atrial fibrillation. Ann Emerg Med. 2008 Oct; 52(4): 322-8. Decker WW and Stead LG. Selecting rate control for recent-onset atrial fibrillation. Ann Emerg Med. 2001 Jan; 57(1): 32-3. Fuster V, et al. 2011 ACCF/AHA/HRS focused updates incorporated into the ACC/AHA/ESC 2006 Guidelines for the management of patients with atrial fibrillation: a report of the American College of Cardiology Foundation/American Heart Association Task Force on Practice Guidelines developed in partnership with the European Society of Cardiology and in collaboration with the European Heart Rhythm Association and the Heart Rhythm Society. J Am Coll Cardiol. 2011 Mar 15;57(11):e101-98. Lafuente-Lafuente C, et al. Antiarrhytmics for maintaining sinus rhythm after cardioversion of atrial fibrillation. Cochrane Database Syst Rev. 2007 Oct 17;(4). Michael JA, et al. Cardioversion of paroxysmal atrial fibrillation in the emergency department. Ann Emerg Med. 1999 Apr; 33(4): 379-87. Scheuermeyer XF, et al. Thirty-day outcomes of emergency department patients undergoing electrical cardioversion for atrial flutter or fibrillation. Acad Emerg Med. 2010 Apr; 17(4): 408-15. Stiell IG, et al. Association of the Ottawa Aggressive Protocol with rapid discharge of emergency department patients with recent-onset atrial fibrillation or flutter. CJEM. 2010 May; 12(3): 181-91. Van Gelder IC, et al. A comparison of rate control and rhythm control in patients with recurrent persistent atrial fibrillation. N Engl J Med. 2002 Dec 5; 347(23): 1834-40. Wyse DG, et al. A comparison of rate control and rhythm control in patients with atrial fibrillation. N Engl J Med. 2002 Dec 5; 347(23): 1825-33.